I am a avid reader. I have been all my life. Out of all the books I've read, this book ranks second to the Bible in how it impacted me. This book changed my life. Richard Stearns is the president of World Vision, an organization dedicated to reach out to help the hurting and broken all over the world. He tell a heart wrenching tale of those in need of the Gospel in action, not just in words. This book was particularly challenging for me because I've never been a big fan of missions. Meaning, I would help if it didn't inconvenience me, but I wasn't willing to make a big sacrifice for those hurting. This book showed me that I was only living half of the Gospel. Stearns presents a very balanced approach to Christian social activism. He rebukes and takes away all excuses anyone would have not to get involved. He shares the problems of poverty, injustice and sickness he's seen as president of World Vision. He shares some harsh but true realities about the American church, ones I wasn't comfortable with being identified with. Most of all, this book has given me focus on what it means to love your neighbor as yourself. It's given purpose to my life. Since I've read this book, I've committed to write for water. When I get a publishing contract, I'm pledge to do everything in my power to bring clean drinking water to someone in need. Of course I have other things I plan to do until I get a publishing contract, like reaching out to single mothers, but I feel like I've had the scales fall from my eyes. This book is a must read for everyone who feels like, despite their religious activities, there is something missing in their quest to become like Jesus. The answer is right between the pages of this book. 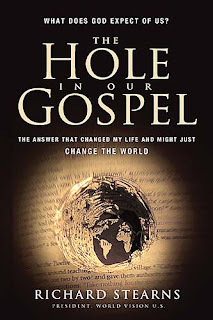 There is probably a hole in your gospel.